Comfort dressing today, oversized knit dress & leggings ftw. I'm not that well still, and I'd rather not have been forced to get dressed, but Im one of those people who simply cant just sit around doing nothing. Im a bit of a workaholic, and it really is one of my biggest downfalls. I have a slight earache and feel very stiff and tired. I'm really hoping its just a extended 24 hour thing and another nights sleep might do me good! If I can I'm going to go into university tomorrow and do something because I haven't done anything productive in what feels like days! I know I shouldn't run myself into the ground, but I need structure in my life of things end up going wrong! Maybe I'm just paranoid though! I haven't owned a blazer in years, I saw this one in H&M and kept putting it off because I really didn't need another black coat. However after a few return trips I did decide to buy it. It felt a bit like fate because it was one of those things that I kept thinking about, coming back, leaving it and then contemplating just how much I wanted it. The slouchy oversized shape really interests me, its just the right amount of the menswear trend. Either way its all good! I've been wearing it loads since I got it and I can 100% say I made the right choice getting it! My mum actually spent some New Look vouchers we got given for Xmas on socks. SOCKS! I love the colour of that nail varnish too, so shiny! I love all your rings! Love the orange knit dress, I see your challenge of adding colour is going well =D! I love your style and you are very pretty! I love the way you mix the colours! Lovely cardigan and your nail polish is lush!! I love the colour of the top that you're wearing in today's photos! love the colors! especially the nail polish and the blazer looks great on you! I'm not usually one for blazers either, but like you, I've really been getting into boyfriend blazers because of their length. They're easy to dress up and down, and I love that you can wear them with dresses or jeans. 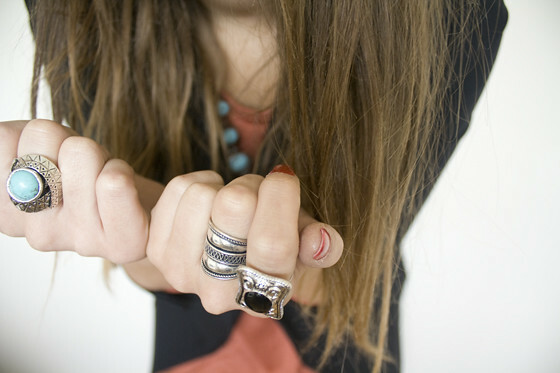 Love those rings! The blazer is gorgeous too; I can't get enough of oversized blazers! Another simple yet fashion forward outfit! You put them together so effortlessly! 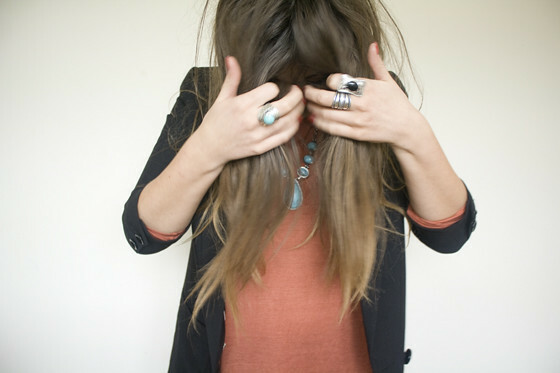 I love your turquoise necklace! I might have to get one myself! Man, I wish i was a workaholic! Good luck getting better. Great outfit- really love that red nail colour. Loving the Strokes related title of this post! Just giving the album a listen now, liking it so far! I have to exact opposite problem to you - I cant seem to get any work done! If I get a cold I retire to my bed for a week, ahaha. The blazer looks beautiful on you! That blazer looks like it would go with a lot of outfits! Love your metallic nails! Hope you feel better soon!!! love the tunic dress! so cute! the colour is pretty too. Adoreeeeeee your rings, absolute beauties they are! Your nails look fabulous! Such great colors in these photos - you are always so cute! Blazer is lovely, so nice. Love the colors and your blazer is amazing ! I really like the blazer on you. I hope you get well soon! I'm freaked out I saw this necklace and thought of you BEFORE your post, but it looks lovely with that outfit! The color of the knit dress is gorgeous on you. I'm glad you finally gave in and got the blazer, because it's totally chic! Adore your nail color and jewelry too! I have this blazer too :) I know what you mean about the boyish fit, it's just the right fit and length! Loving the jewelery too! Isn't it funny how some items of clothing haunt us from the stores? And then we fantasize about them until we get them? I think that it's always the pieces I end up liking most that I do this with! Is it normal to fantasize about clothing?!? Haha. The colour on the dress suits you and the blazer is a lovely staple piece. Hope you are feeling better soon hun! ooooo, i need to get a big blazer, mines so outdated! Great blazer! Suits you so well and It's nice to know you're determined but get yourself better! I love this outfit! The sort of stuff I love wearing. This blazer is defs on my wishlist now! Cheers lily you've inspired me to write my own blog..which i've started today eek! check it out sometime soon if you get a minute, maybe not just yet.. wait til i've written something of actual interest haha anyways keep up the good work! Love your style. Love your blog. Love your hair. Gosh, wish my hair was as long as yours!